Layouts: Boardroom, U-shape, theatre, cabaret, classroom, catwalk. 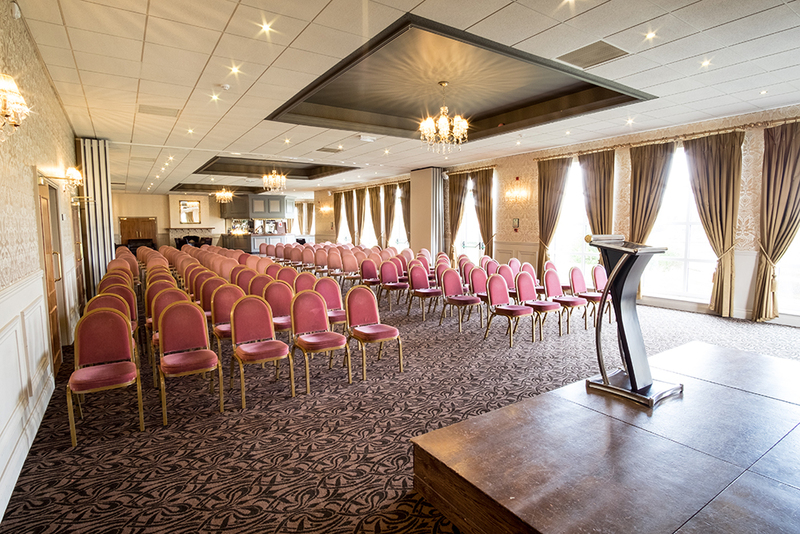 The light and spacious conference facility can accommodate anything up to 200 delegates in a selection of room styles. A perfect room size for large seminars, staff briefings, training sessions and general meetings. The room is flooded with natural day light, overlooking the manicured gardens and countryside views. As shown in the above picture, the room has an elegant style and feel to really impress your clients and delegates. The golden draped ceiling height curtains, neutral boarders and plush brown carpets all compliment the great surroundings. Large chandeliers tastefully hang throughout the room as the alcoves reflect the magnitude of light. In a relaxed and comfortable setting the room has a modern, rectangular shape with the option of a sound proof partition to split the facility in 2 halves, ideal for separate sessions or exam conditions. The staged area, measuring at 2.4m in length by 1.4m in width is suitable for the host to project videos and presentations along with a stylish lectern to hold your notes and AV equipped. Our delegate rates are fully inclusive of conference packs, stationary, AV equipment, screens and flipcharts. Complimentary Wi-Fi is always available along with free car parking facilities.